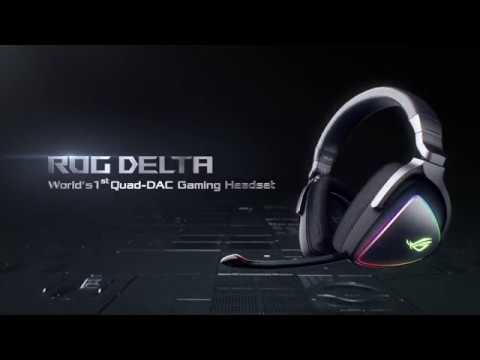 CLARITY FOR THE WINThe ROG Delta is the world’s first headset with circular rainbow RGB lighting effects, with industry-leading sound quality for impeccable clear sound, giving gaming enthusiasts the edge they need for victory. ROG Armoury II is a software that offers extensive controls and an intuitive UI, so you can easily tune ROG Delta to play your way. 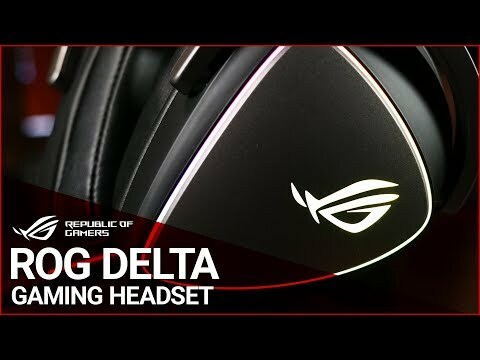 ROG Delta features a USB-C connector and comes with a USB-C to USB 2.0 adapter to let you game on your PC, console and mobile devices without changing headsets. ERGONOMIC D-SHAPED EAR CUP ROG Delta has innovative D-shaped ear cups that more closely match the shape of human ears compared to regular oval ear cups, reducing the unnecessary contact area by 20% for a better, more comfortable fit, especially when wearing the headset for long periods. It provides two types of fit and feel for you to choose from based on your preference. ROG Hybrid breathable fabric mesh is perfect for long gaming sessions, and the lightweight protein leather is thinner and softer, perfect for on-the-go use. EXCLUSIVE CIRCULAR RAINBOW LIGHTING Show off your style with Aura RGB software. 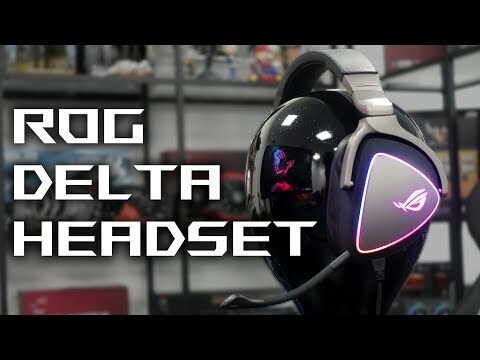 ROG Delta leaves single-colour lighting behind as the world’s first gaming headset to feature rainbow circular RGB lighting. This captivating effect features seven different lighting zones with dazzling multicolour cycling displays. Use Aura to synchronize the colours of all your gear and pick from over 16.8 million colour combinations and six lighting effects that any gamer would envy. hear every detail with True-to-Life audio The hi-fi grade ESS 9218 Quad-DAC delivers lossless audio processing with each DAC devoting its processing power to a subset of the audible frequency range, from lows, mids, highs to ultra-highs. The four signals are then combined, which ultimately produces clearer sound with an impressive 127-dB SNR, which is higher than any device in the market. As a result, you can hear and place in-game sounds with pin-point accuracy, letting you easily judge enemy distance. Hear every detail and enjoy truly immersive sound. EXCLUSIVE HYPER-GROUNDING TECHNOLOGY Hyper-Grounding is ROG’s exclusive technology, which utilises a multi-layer PCB and special layout design to prevent electromagnetic interference, resulting in pure, noise-free audio. It unlocks its full potential to provide gamers with rich, powerful sound incomparable versus other gaming headsets. AUDIO SIGNAL DIVERSION With ROG Delta, the exclusive ASUS Essence drivers have been updated with Audio Signal Diversion technology, giving them a circular wall that helps separate high, low and medium frequency sounds, reducing interference between frequency ranges for purer and clearer audio, with a wide frequency response of 20Hz – 40Hz. EASY, ACCESSIBLE VOLUME CONTROL Intuitive control buttons on the ear cup let you instantly adjust volume and RGB lighting, and a durable rocker switch lets you easily mute the microphone during gameplay. see your microphone’s status with the indicator A detachable, unidirectional boom microphone comes with the ROG Delta, which is tuned especially for clear voice communication. A handy indicator on the end of the boom flashes red when the microphone is muted, letting you easily see the microphone’s status. enjoy class-leading performance, anytime, anywhere. Enjoy the ROG Delta’s superior sound wherever you are, featuring a USB-C connector and a USB-C to USB 2.0 (Type-A) adapter, allowing you to connect with nearly every gaming platform, including PC, consoles, handhelds and mobile devices. Enjoy this high-calibre sound anytime, anywhere.